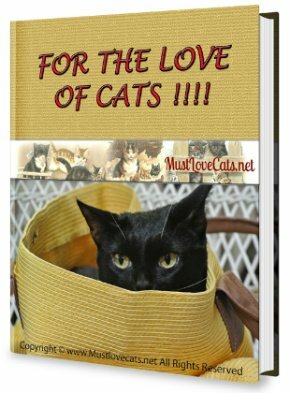 Here you will learn how to determine your cats age and lifespan. The average lifespan of an indoor domestic cat is around 16 years, which will vary from breed to breed. Indoor cats live longer than outdoors cats - which average around 3 years, because they do not face the dangers that outdoor cats face, such as: traffic, diseases, stress, starvation, and attack from other predators. The cat lifespan can also be affected by a number of factors, such as: diet, exercise, living conditions, genes, physical and medical care. Spayed and neutered cats also live longer because they do not develop ovarian or testicular cancers. Lifespan of mixed breed cats usually live longer than purebreds due to the fact that their genetic makeup normally shields them from hereditary diseases. 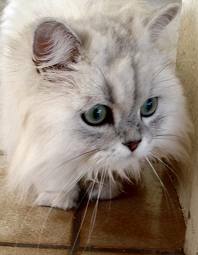 The cat that holds the Guinness World Record for the oldest cat ever is Creme Puff. Owned by Jake Perry of Austin, Texas, she was born on August 3, 1967 and lived until August 6, 2005, just three days after her 38th birthday. Cat Years And Their Human Equivalent. It has been said that cats age the equivalent of seven human years for each year of life, which is a misconception. In reality, cats age more rapidly during the first two years of life. From helpless kittens to teenage in just six months. During this phase they are very energetic and still greatly depend on others. During their first year, cats reach the approximate human age of 15, then 24 at age 2. From its first year, most cats are full grown, becoming wiser and more independent. After their second year, cats ages approximately four "cat years" for every calendar year. Outdoor cats tend to age more quickly than indoor cats, due to their life challenges. 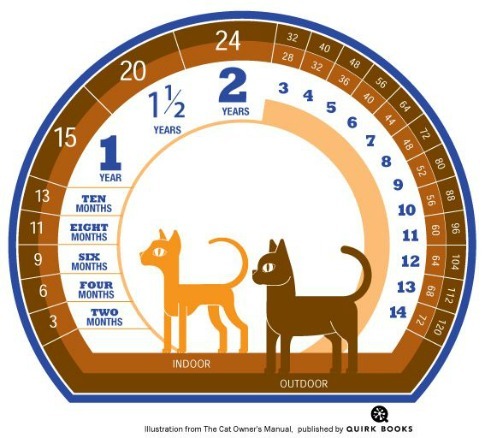 How to Tell a Cat's Age? If you've taken in a stray cat or adopted a cat whose age is unknown, there are a few characteristics that can you can look for that can help you to estimate your cat's age. Examine the cat's teeth to determine if it has its baby teeth or adult teeth. Kittens will have all of their baby teeth by 8 weeks, and all of its adult teeth by 6 months old. If the cat has its permanent teeth and they are white, the cat is at least 16 weeks of age. Yellowish stains (tartar) on its back teeth, the cat might be 1 to 2 years old. The older the cat the more tartar and wear on the teeth he or she will have, usually seen at 5 to 10 years old. Senior cats - 10 years and older, might be missing some teeth and heavy tartar buildup. Another way to estimate your cat's age is by its eyes. 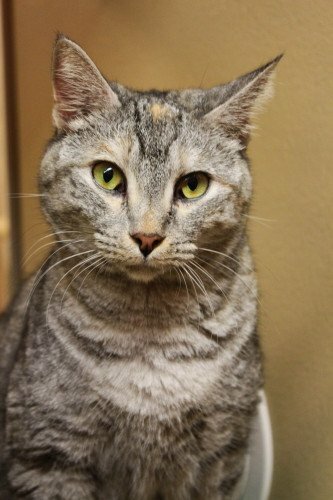 Younger cats will have bright and clear eyes, in addition to smooth iris. 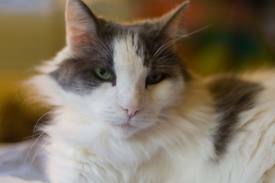 Older cats - 12 years old and older, will show some cloudiness in their eyes, they can also develop cataracts. Additionally, their iris will become more jagged and rough looking. The body of your cat can also help you to determine its age. Young cats are more likely to be in shape and be toned from their higher activity level. While older cats might have extra skin hanging, and protruding shoulder blades. Finally, your cat's habits. Younger cats are usually more playful than an older cat. Older cats will not be impressed by toys and activities and will sleep more. Your veterinarian can also help you to determine your cat's age.